Shadow of elections may overshadow political consensus at GST Council meetings. "Efforts at forming a 'federal front' in the political firmament may have remained stillborn. But such a front, comprising a ginger group of state finance ministers, has taken shape in the GST (goods and services tax) Council, and is increasingly prepared to demand voting if the Centre were to push for passing any thorny tax proposal in forthcoming meetings of the Council. A spirit of consensus has characterised the 27 meetings of the GST Council. Its 28th meeting is scheduled for July 21. Finance ministers of state governments run by the Congress, the Left and regional parties have indicated they would be unwilling to support contentious tax proposals unless their concerns are met. Two such sticking-points are the Centre's intent to put a cess on sugar, and include petrol and diesel in the GST. On Friday, June 29, Kerala Finance Minister Thomas Isaac implied how consensus could elude subsequent GST Council meetings. "(The GST rate of) 28 per cent will not be scrapped. No fundamental changes in the GST structure until everything settles down and we observe the outcome. We cannot be in a permanent state of flux," he said. 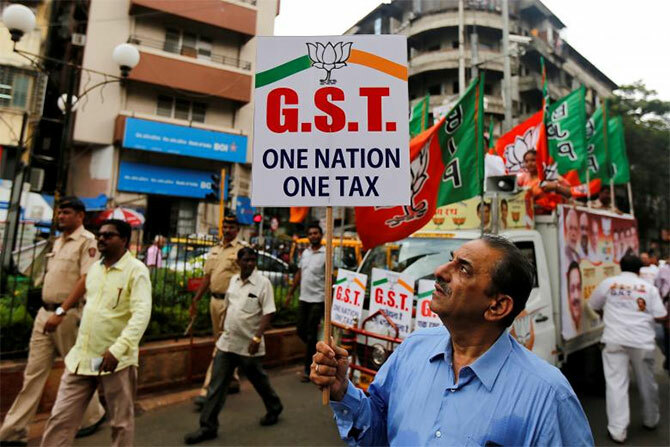 Wary of criticism, the Centre did not invite any of the state finance ministers for the 'GST Day' celebrations to mark the first anniversary of the GST roll-out on July 1. Union Finance Minister Piyush Goyal will be the chief guest at the event, and Union minister Arun Jaitley, who is convalescing, will address the conference via videoconferencing. Until now, Opposition finance ministers have advisedly not pushed for voting in GST Council meetings. Decisions at the GST Council need to be taken with a three-fourths majority. The Centre's vote has one-third weight. The votes of all the state governments put together have a weight of two-thirds of the votes cast in a meeting. "It didn't make any political sense to push for a vote. The Bharatiya Janata Party and its allies have governments at the Centre and in a majority of the states. They have an overwhelming majority in the council," Punjab Finance Minister Manpreet Badal recently said. But this is set to change with the Lok Sabha elections, a little more than nine months away, and the assembly elections to three key north Indian states to be held in November-December. The Narendra D Modi government is facing increasing criticism from political rivals, sundry stakeholders and even allies like the Rashtriya Swayamsevak Sangh and affiliate outfits for its 'hurried' GST implementation. At the fourth meeting of the NITI Aayog Governing Council on June 17, several Opposition chief ministers flagged their concerns about the implementation of the indirect tax. The number of critics of the Modi government has also increased in the Council. Andhra Pradesh Chief Minister N Chandrababu Naidu, one of the earliest supporters of the tax reform, has turned a critic after his Telugu Desam Party exited the BJP-led National Democratic Alliance in March. The BJP's Sushil Modi currently represents Bihar in council meetings, but the BJP's ally, the Janata Dal-United, has started tugging at the reins, and Chief Minister Nitish Kumar has taken to voicing his concerns on the Modi government's schemes. The personal rapport Jaitley has with several Opposition chief ministers, and state finance ministers had contributed significantly to consensus building in GST Council meetings. Of these, Jaitley has frequently acknowledged the help of West Bengal Finance Minister Amit Mitra and then Jammu and Kashmir finance minister Haseeb Drabu. Mitra's initial support to the GST has lately been replaced by a more discriminating assessment. It cannot be said if this shift has something to do with the BJP emerging the principal opposition to the Trinamool Congress, the party to which Mitra belongs, in West Bengal, but he has raised several lacunae in the GST's implementation. He recently told CNBC TV18 that the current GST structure was a 'horrible mess'. In the coming months, state finance ministers are likely to repeatedly raise problems that small businesses and traders have faced. Such businesses comprise a group the BJP has traditionally considered its core support base, but the Modi government has now taken to reach out to poorer sections. On Friday, the Confederation of All India Traders asked the Centre to make return filing and refund process simpler. It said while it has been supportive of the GST, its patience with the government was running thin. Trade outfits, and those representing micro, small and medium enterprises, have also been meeting the BJP leadership, including party chief Amit A Shah, to apprise them of their problems with the GST. The Centre had to push for several changes in the tax structure in the run-up to the Gujarat assembly polls last year.